This is “Uses, History, and Creation of Mortgages”, section 11.1 from the book The Legal Environment and Government Regulation of Business (v. 1.0). For details on it (including licensing), click here. Having discussed in Chapter 10 "Secured Transactions and Suretyship" security interests in personal property and suretyship—two of the three common types of consensual security arrangements—we turn now to the third type of consensual security arrangement, the mortgage. We also discuss briefly various forms of nonconsensual liens (see Figure 11.1 "Security Arrangements"). A mortgageSecurity in which collateral is land. is a means of securing a debt with real estate. A long time ago, the mortgage was considered an actual transfer of title, to become void if the debt was paid off. The modern view, held in most states, is that the mortgage is but a lien, giving the holder, in the event of default, the right to sell the property and repay the debt from the proceeds. The person giving the mortgage is the mortgagorOne who gives a mortgage; the debtor., or borrower. In the typical home purchase, that’s the buyer. The buyer needs to borrow to finance the purchase; in exchange for the money with which to pay the seller, the buyer “takes out a mortgage” with, say, a bank. The lender is the mortgageeThe party who holds a mortgage; the creditor (such as a bank)., the person or institution holding the mortgage, with the right to foreclose on the property if the debt is not timely paid. 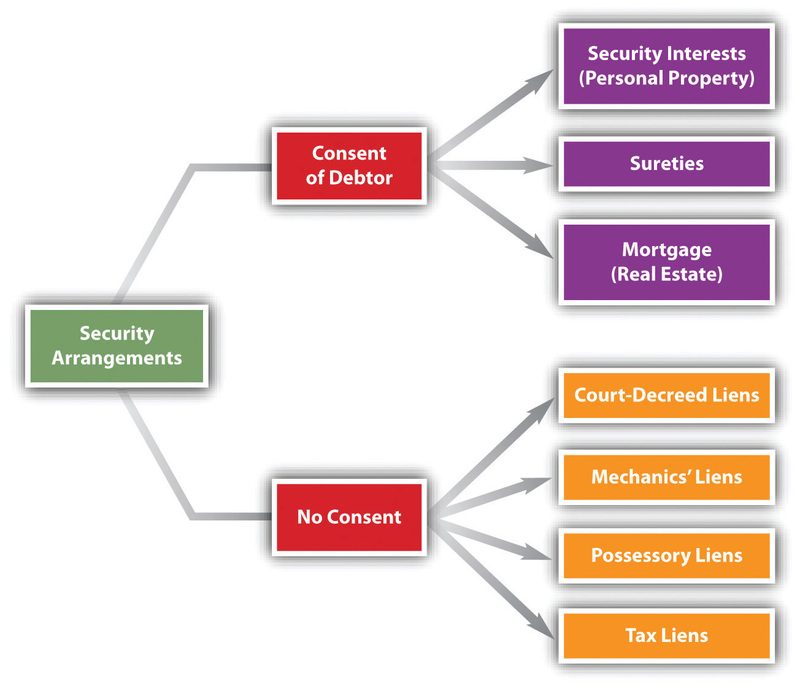 Although the law of real estate mortgages is different from the set of rules in Article 9 of the Uniform Commercial Code (UCC) that we examined in Chapter 10 "Secured Transactions and Suretyship", the circumstances are the same, except that the security is real estate rather than personal property (secured transactions) or the promise of another (suretyship). Statutes dealing with consumer credit transactions (as discussed in Chapter 9 "Consumer Credit Transactions") have a bearing on the mortgage, including state usury statutes, and the federal Truth in Lending Act and Equal Credit Opportunity Act. One particular provision that usually appears in both mortgages and the underlying notes is the acceleration clauseA contract clause providing that the entire amount owing in debt becomes due if one payment is missed.. This provides that if a debtor should default on any particular payment, the entire principal and interest will become due immediately at the lender’s option. Why an acceleration clause? Without it, the lender would be powerless to foreclose the entire mortgage when the mortgagor defaulted but would have to wait until the expiration of the note’s term. Although the acceleration clause is routine, it will not be enforced unless the mortgagee acts in an equitable and fair manner. The problem arises where the mortgagor’s default was the result of some unconscionable conduct of the mortgagee, such as representing to the mortgagee that she might take a sixty-day “holiday” from having to make payments. In Paul H. Cherry v. Chase Manhattan Mortgage Group (Section 11.4 "Cases"), the equitable powers of the court were invoked to prevent acceleration. Under the statute of frauds, the mortgage itself must be evidenced by some writing to be enforceable. The mortgagor will usually make certain promises and warranties to the mortgagee and state the amount and terms of the debt and the mortgagor’s duties concerning taxes, insurance, and repairs. 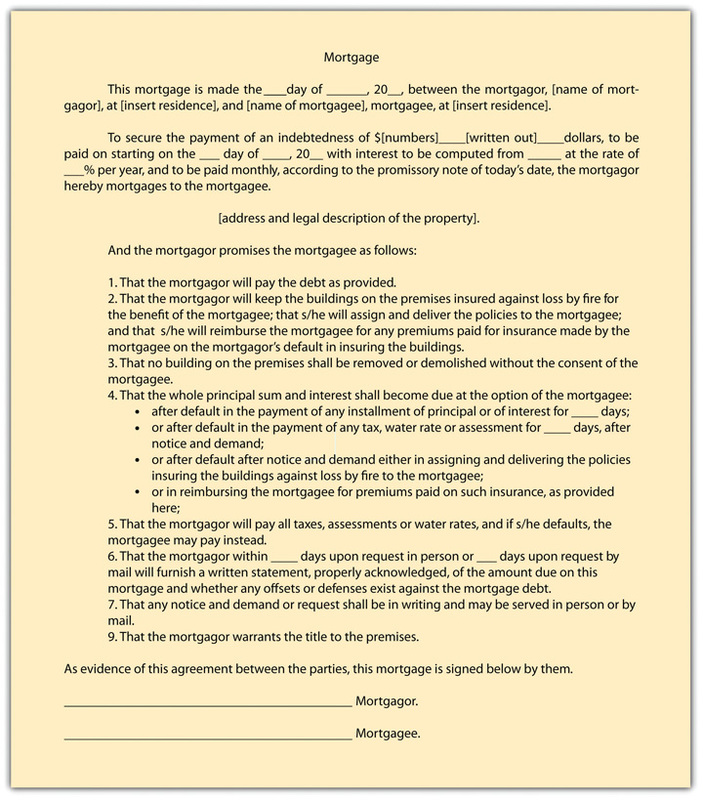 A sample mortgage form is presented in Figure 11.2 "Sample Mortgage Form".